Notes: The quoted numbers apply for when you beat the game with the best ending. – Turns taken to complete chapters Basically complete chapters in as few turns as possible. Around 630 Turns or less is required for a A Rank. – Ratio of wins to battles Wins are when you KO the enemy. 40% of all battles resulting in wins is enough to get a A Rank. – Amount of characters alive Only recruited playable characters affect this. If no characters died, you will get a A Rank. – Amount of experience gained You need to obtain 50,100 Exp or over to obtain a A Rank. – Physical gold + (Worth / 2) of all items Items that can’t be sold (eg. the Divine Weapons) count as 0G. Your gold and items must add up to 84,000G or over in order to get a A Rank. – Total Level of all recruited characters For promoted character Levels, add 20. Dancer, Bard and Mamkute count as non-promoted classes. You need 1001 or more Levels to get a A Rank. – All six above categories combined. 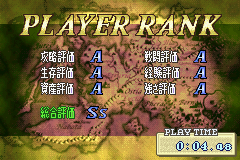 If you obtained A Ranks in all six categories, you will get a S Rank (Normal mode) or a Ss Rank (Hard mode).